publish.nyc.indymedia.org | A Requiem for Critical Mass? A Requiem for Critical Mass? One rider writes: " Critical Mass is no longer fun, thanks to intense police harassment." Resistance is futile? Nope just hard work. 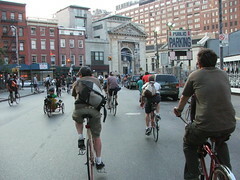 I've been doing Critical Mass for years, I remember the crazy fun times pre-RNC. That was a different time, we took our liberties for granted. Now we have to do the long hard struggle that other folks in our Sister city San Francisco have done, eventually wearing out the administration. It was hard, but they WON! I was pretty nervous in the ride last Friday, they really wanted a body count and to inflict fear, but still we rode. My favorite part was after a group of over 100 of us escaped a police blockade in the West Village, we circled around and reappeared in front of the blockade taunting them as we zoomed by and cheering on our fallen comrades. We need to be smarter. Leaving from multiple locations and massing up later works (use word of mouth and get trusted phone buddies), avoiding certain patterns, having good re-con intel, use smartmob http://www.smartmobs.com tech and aggressive leafleting during the ride. Use the system against them, if you're separated and you see the chopper, thats probably where the mass is. Sure its cat and mouse, but 21st century style. I think the ride needs to and should remain leaderless and mostly random, just not goofy. It will be harder as it gets colder, but there is strength in numbers, and I'm really looking forward to the halloween costume ride! !